If you are self employed yet you are in a business where you can not reasonably describe yourself as a consultant, this document is for you. 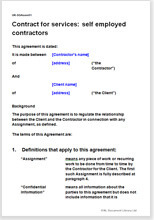 If you are a consultant choose from the consultancy agreements linked right. For thousands of self employed people some version of this document will be presented to a new client as “my contract”. For any business using self employed people it provides the essential starting point for the relationship. This contract for services is suitable for a self employed person in any field or a “client” requiring a contract to set out trading terms with a consultant or self employed person. Although this self employment agreement clothes the transaction with all the characteristics of sole trading, simply using one of these contracts will not necessarily avoid the relationship of employer and employed. Both Revenue and Customs, the ATO and any industrial tribunal will be entitled to look behind the agreement at the reality of the contract. Complete with explanatory guidance notes at every stage. Appropriate legal provisions to protect your interests.